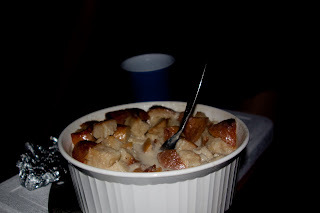 So the entry a lot of you have been waiting for…Jack Daniel’s Bread Pudding. Everyone knows how much I love bread pudding. This first appeared during my birthday week….amazing. We’ve obtained the secret recipe, and I added some of my own secrets. Personally I really liked my version because the sauce was not as liquid-y as the one from my birthday. It’s important to get really tough and crusty sourdough bread, so the final pudding isn’t mushy or slimy. Preheat oven to 325. Beat the eggs and add the butter, vanilla and milk. Gradually add the sugar and mix until sugar is dissolved. The butter will lump up a bit when the cold milk hits it – don’t worry about it. 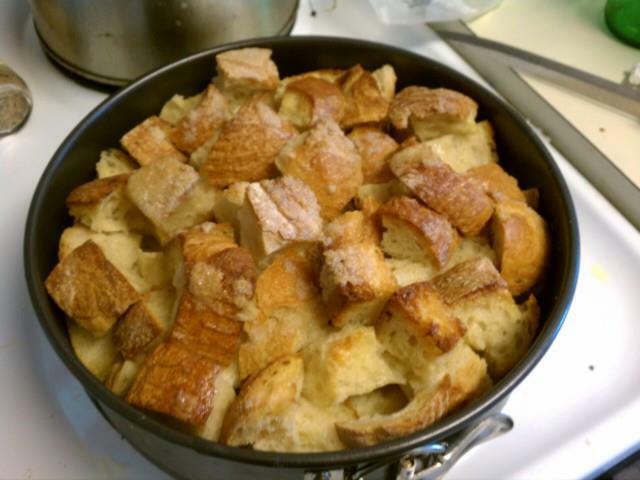 Place bread cubes in bottom of round baking dish. I save the bits with the most crust on them to use at the top for presentation. The crust gets golden and is more visually appealing. Pour liquid over bread , making sure all pieces are saturated. Bake in the oven for 50 or 60 minutes. It’s supposed to serve about 8 people. Or if you eat like me, maybe only 4. Combine ingredients in a medium saucepan. Stir constantly over low heat until mixture reaches a low, rolling boil for about 30 seconds, then take off the heat. When it cools, put it through a blender for a few seconds, so it won’t separate (I did not do this so well but oh well). This photo shows the bread pudding without the sauce. I forgot to take a picture when I put the sauce on. Got too hungry I guess. When I was ready to warm up the bread pudding again, I actually poured some of this sauce into the bread pudding and baked it in. Then I warmed up the sauce and stirred it together before serving it to people. Pour a hearty amount over each serving. Or drink the sauce. Enjoy! If you try this let me know!